When downsizing your life it does not mean the end to holidays. Rather than spend your money on expensive hotel breaks why not try camping instead? By travelling with your own accommodation the world is your oyster – an inexpensive oyster! If you have never experienced a camping holiday in recent years you have missed a treat. Perhaps memories of Scout or Girl Guide camps have put you in fear of ever sleeping under canvas again but accommodation under canvas has moved on since then and a modern camping holiday can be a luxurious adventure. If you are still in doubt why not rent or borrow some camping equipment and try a weekend away from home before investing in your own camping gear? When planning your camping trip speak to friends and family who have taken camping holidays. You can’t go wrong if a campsite is recommended. Do not think that you can just pitch your tent in any green area, the field will no doubt belong to a farmer who will be none too pleased to find a family living where he is just about to put a herd of cattle or plant his crops. Newsagents and bookshops sell magazines and books for those interested in camping and caravanning and you will find a camp site very easily in the part of the country that you wish to visit. Indeed, with your camping equipment packed into your car you can visit any part of the world. There is a caravan and camping association that keeps members informed of sites and news of the camping scene and is a valuable asset to any camper. 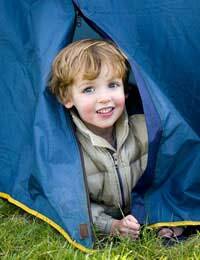 Unlike booking a holiday in a hotel you will have to arrange your choice of camping equipment. Accommodation can vary from a small tent that can be carried on the back and is ideal for hikers and bikers to a tent with separate rooms. Perhaps you want more luxury and opt for a trailer tent that opens up into a form of bungalows. On top of this you can carry all forms of camping equipment that means you have access to toilets, refrigeration, cooking and washing facilities. Travel light or in the lap of luxury – the choice is yours. Remember that once you have your equipment it can be used for many happy holidays and unlike staying in hotels if you do not like the site you have booked you can up camp and move on. Of course when staying in a hotel your accommodation is waiting for you along with your meals. When taking a camping holiday you will have to find somewhere to store the equipment at home and also plan your meals on your camping holiday. With the availability of cooking equipment you can eat as well during your camping trip as you do at home. For those who do not like to cook on their holidays many camping sites have a cafe or restaurant for holiday makers. Do you expect to be entertained during your stays in hotels? When taking a camping holiday you can also book onto caravan and camping sites that have full facilities. Children’s clubs, sports for adults and cabaret evenings can now be found with ease for the use of people booking onto the campsites. Many farms also have campsites with washing and toilet facilities so for a happy family farm vacation consider this instead of taking a young family to a hotel and making day trips to the farm. Like many good holiday spots and hotels the better campsites can get booked up early on. When planning your trip book ahead rather than turn up and be disappointed. With web sites, tourist boards and travel guides giving details of camp sites worldwide the novice camper will be spoilt for choice when they decide to take up camping.